The 2019 NFL Draft is a long way away, but during this slow time of the offseason, it's perhaps worth taking a look down the road at the Philadelphia Eagles' biggest draft need next year, which in my view is the defensive line. The Eagles' depth along their defensive line currently looks like this, with players 30 years of age or older bolded. In the Eagles' scheme under Jim Schwartz, the success of the defense lives and dies with the front four's ability to not only generate a pass rush without the aid of many blitzes, but to also create disruption against the run. In 2017, the Eagles' front four was able to do both, as they were the primary reason for the defense's 31 takeaways, as well as their No. 1 ranked run defense. For those of you who cannot count, the Eagles have four players in the chart above who figure to be a big part of the defensive line rotation who are 30-plus years of age. Add in that Timmy Jernigan is a 300-pound man recovering from back surgery and Brandon Graham is currently heading into the final year of his deal (to be determined if he signs a contract extension), and the Eagles have a serious need for young defensive line playmakers. 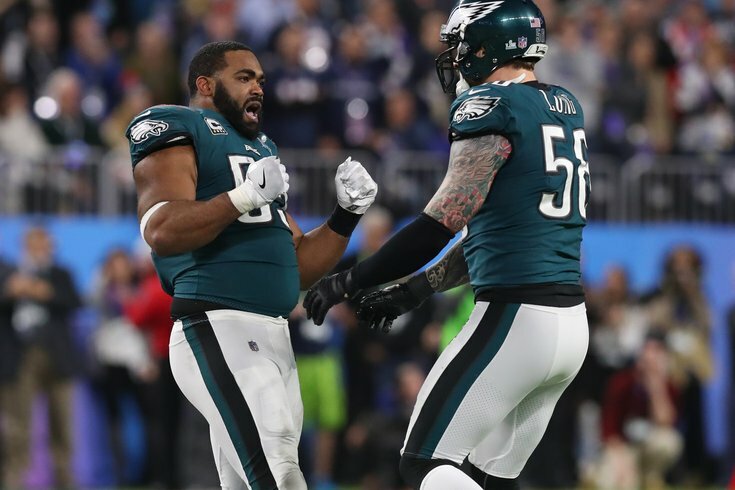 Fortunately for the Eagles, the 2019 NFL Draft is likely to be loaded with defensive line talent. Earlier this month, ESPN's Mel Kiper released his top 25 prospects for the 2019 NFL Draft. While a lot can (and will) happen between now and the draft next year, it's worth pointing out that 10 of Kiper's top 25 players, and the top three overall, are defensive linemen. 1. Ed Oliver, DT, Houston: From a production standpoint as a game-wrecker on the defensive interior, Oliver could get some Aaron Donald comps -- which ain't bad company. Oliver has 38.5 tackles for loss through two seasons, and he played at less than 100 percent for a stretch of 2017. 2. Nick Bosa, DE, Ohio State: Pops was a first-round pick, big brother was a first-round pick, and now Nick is well on his way. He has length (6-foot-4) and strength, and isn't just a sack artist as he uses his hands well and finds the football. He had 16.0 tackles for loss in 2017. 3. Rashan Gary, DT, Michigan: An absolute man-child in high school, Gary came out of New Jersey ready to compete along a stacked Michigan D-line in 2016, and has been on a solid developmental path since. Expect a huge junior year. 8. Dexter Lawrence, DT, Clemson: At 6-foot-4 and 340 pounds, Lawrence isn't just a clogger on the interior -- he also has beaten blockers and chased down runners and quarterbacks. Big-bodied dudes who move like Lawrence and can eat gaps don't last long in the draft. 11. Clelin Ferrell, DE, Clemson: Clemson lucked out in getting Ferrell back after a 9.5-sack, 18.0-tackle for loss season. He could surpass those totals in 2018 on a line that could be close to unblockable. By the way: Clelin rhymes with Lee-Lynn. I'm here to help! 13. Raekwon Davis, DE, Alabama: At 6-foot-7, Davis moves more like an NBA small forward than a D-lineman when he's actually in space, which is scary because most NBA wingers aren't packing 310 pounds. He had 8.5 sacks on a first-one-to-the-QB defense in 2017 and could do more damage in 2018. 15. Derrick Brown, DT, Auburn: Long and powerful at 6-foot-5 and 325 pounds, he's coming off a breakthrough campaign and could be truly dominating as a true junior. When a guy like this isn't one of the top couple of defensive tackles early on in the process, it shows the potential depth at the top of the D-line class. 21. Zach Allen, DE, Boston College: The 6-foot-5, 285-pound lineman has grown into a big-time prospect because not only can he rush the passer, he can play the run and fight through blocks to make plays. A lineman who can pile up 100 tackles while balancing pass-rush duty has a high floor. 23. Jalen Jelks, DE, Oregon: An athletic project upon arrival, Jelks has become a major prospect during his time in Eugene. At 6-foot-6 and 250-plus pounds, he has length and quickness and pass-rushing upside. He piled up 15.5 tackles for loss last season. 25. Montez Sweat, DE, Mississippi State: Out of high school you'd have pegged Sweat as a tight end prospect if he made this list. Instead, the athletic, 6-foot-6 pass-rusher is coming off a 10.5-sack season and could be one of the best pass-rushers in the country in 2018. That is an absurd potential amount of defensive line depth in one draft. 7 Either the Eagles' own pick, or the pick acquired from Broncos for Allen Barbre, depending on which one they traded during the 2018 NFL Draft, which has yet to be determined. While the Eagles will likely be drafting near the end of the first round once again next year, they will have draft pick ammunition to target and move around for one of the many defensive linemen in what could be one of the most loaded DL classes ever.